Readers will be inspired by this artful cover—designed by the iconic Hatch Show Print—as they read Scripture. The delightful and enduring letterpress technique of Nashville’s own Hatch Show Print combined with the highly readable and easy-to-understand Common English Bible translation make this new series of text Bibles a bookshelf essential. One hundred and twenty biblical scholars representing twenty-two faith traditions worked together to create the CEB—a fresh translation of the Bible that speaks to people of various religious convictions and cultural backgrounds. And the Hatch Show Print cover designs could not be more vibrant and inviting. 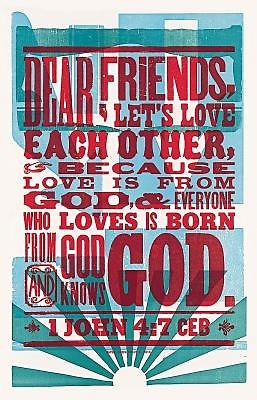 This edition's cover features this verse: "Dear friends, let’s love each other, because love is from God, and everyone who loves is born from God and knows God," (1 John 4:7 CEB). This text Bible includes the Apocrypha.